This year was one of the most difficult for Russian concert agencies and heavy music fans. Due to devouts people's activity more than ten shows of foreign metal bands were cancelled. Some of metalheads and journalists believe that they're only marionettes in the hands of the more influential people. But just a few Orthodox activists have become the main whipping-boys in the current circumstances. Noizr's journalists made a compilation of cases that shows how religious leaders have affected the situation with concerts in Russia. A few days metalheads' attention was focused on a Polish black metal band Behemoth, which on May 21st, was arrested before the concert in Yekaterinburg. 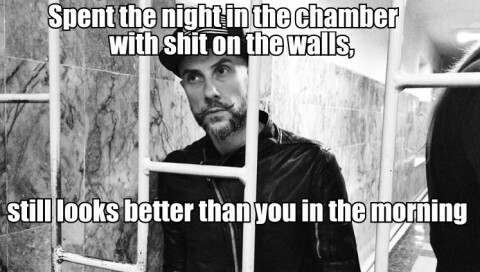 Later in the interview vocalist Nergal will tell that the detention conditions left much to be desired: the walls were smeared with feces, and the musicians were not taken to the toilet, that's why they had to use bottles. To the delight of fans and partial people, all band's members were released the next day after their arrest and trial. We recommend you to read Noizr's article "Behemoth's incredible misadventures in Russia" to provide a more complete picture of all that happened with a band during the Russian tour. Marilyn Manson and his eponymous band have never been left without attention of moral guardians. Musicians' scandalous image could have not been interesting for Russian religious activists, inspired by the deeds of the medieval Inquisition. 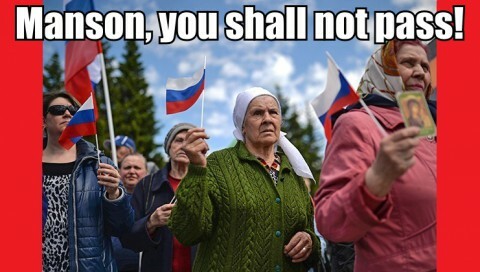 Disgruntled Russians had been prepared in advance to Marilyn Manson's shows in Novosibirsk and Moscow festival Park Live. A few weeks before the band's arrival communities like "Novosibirsk against Merlin's Manson" began to appear in social networks. Also a petition was sent to the authorities and upcoming protest against the musician was advertised, which, according to RIA Novosti, in the end, was attended by more than 400 people. In addition, some Zadoya Y. A. and "representatives of public organizations" sent a statement to the Novosibirsk Centre for Extremism Prevention MOI of the Russian Federation to initiate criminal proceedings against the band Marilyn Manson. However, after linguistic analysis of the texts and a cancelled concert in Novosibirsk, the investigator issued to refuse the activists because of the lack of "criminal offense", as well as extremist materials in the songs. 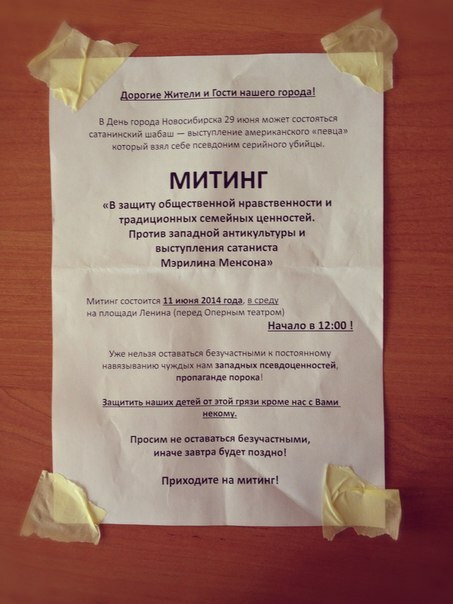 Despite of all attempts by the organizers of the Agency "Sibirskie gastroli" to resolve the conflict in favor of the musician's fans (sending a petition to the mayor of the city, holding a protest to the event support, making a proposal to postpone the show to another day and so on) the concert in Novosibirsk was cancelled. The same fate befell the band's performance at the Park Live festival: before the musicians entered the stage, the police had received a message about the bomb threat. This information was confirmed by the vocalist in his Twitter. According to Russian journalists, later the press service of the city's Ministry of Internal Affairs reported that suspicious items weren't found during the survey of the territory. Shortly before the police intervention, one of the Orthodox activists Dmitry Enteo on his Vkontakte page agitated people to call the police and report that "now the event will begin, which violates a number of Russian Federation laws". By the way, this religious leader was one of the protest's participants, which was held near the hotel Ararat Park Hyatt, where the musicians stayed. According to Enteo, "the terrible Manson 2 minutes tried unsuccessfully to run from the activists." However, in this short video we can't see Mr. Manson or his musicians, only Dmitry, his followers, a few Manson's fans and some an unknown young neformal man, who was running away from rumpled looking activist. And this devout tried to pour some liquid on the man. "Why are the people that proclaim that music inspires violence, the ones that create such entropy?" After so much attention of religious fanatics to metal bands' creativity in early 2014 it would be strange to expect from them the adoption of Cannibal Corpse's shows in Russia. 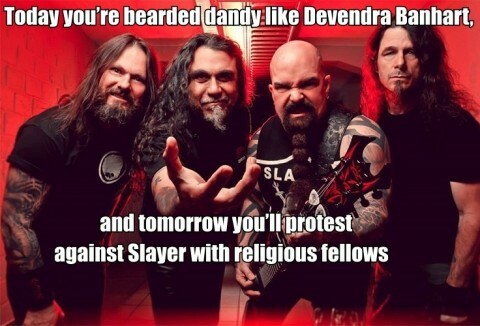 One of the most famous death metal bands is no stranger to prohibitions and perturbations of conservatives, and another thing — the Russian metalheads who have lost the opportunity to attend concerts of favorite bands. From the whole Cannibal Corpse's Russian tour a full four gigs out of eight were held. Three shows in Ufa, Moscow and St. Petersburg were cancelled. In the latter city it couldn't have been without clashes between metalheads and OMON (special-purpose militia detachments), whose attempts to arrest, according to t he journalist Sergey Chernov, looked "pretty brutal". The fourth show in Nizhny Novgorod was thwarted by the staff of the Federal drug control service (FDCS), who began to check the visitors for the presence of illicit drugs in the concert hall. 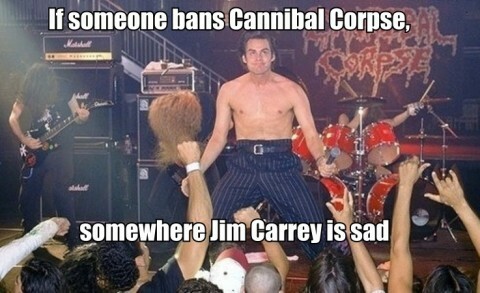 "The Cannibal Corpse's concert in St. Petersburg is cancelled. We have tried. Special regard to our dear Tatar brother, the danger for sodomites from the Northern Capital, God save him." By the way, Enteo offered Cannibal Corpse's, Behemoth's and Marilyn Manson's fans to exchange unused tickets for a performance of "crazy rock concert band "The Sons of Russia" and its unstoppable soloist — father Raphael". Cannibal Corpse's musicians posted a statement to Russian fans at the end of the tour. The band, referring to the provided explanation from the organizers, reported that the concert in Ufa wasn't held because "the power was turned off shortly before the show", and in Nizhny Novgorod — due to the police raid. In Moscow and St. Petersburg shows were canceled because the musicians were threatened with deportation in case of performance, due to the incorrect visa. The band apologized to the fans and expressed hope that the situation in Russia regarding Cannibal Corpse will change for the better and they will be able to come there again. 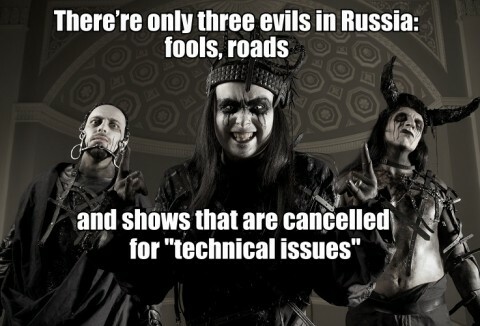 Unfortunately, the hopes of the Russian metalheads and musicians were not justified. 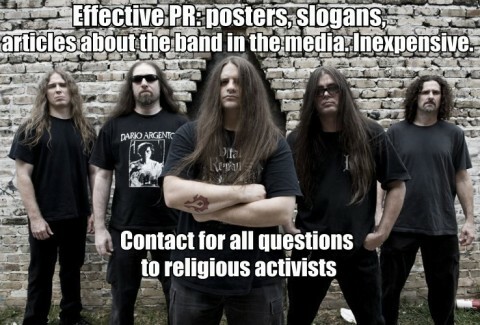 At the end of November, the TASS reported that Cannibal Corpse's lyrics have been banned from distribution in Russia. Due to the court decision, which "recognized that the information in the songs cause harm to the health and development of minors". Curious, shall the film "Ace Ventura: Pet Detective" be subjected to censorship in Russia, due to one of it's scenes with Cannibal Corpse's gig? The quote which was taken from the comments at the Russian site and a little rephrased by Noizr's journalists, we believe, accurately reflects the current state of things. Because people who could spend their religious zeal to help orphans, disabled persons and stray animals instead of organize protests against the metal bands' scenic image, their songs and in general any activity. 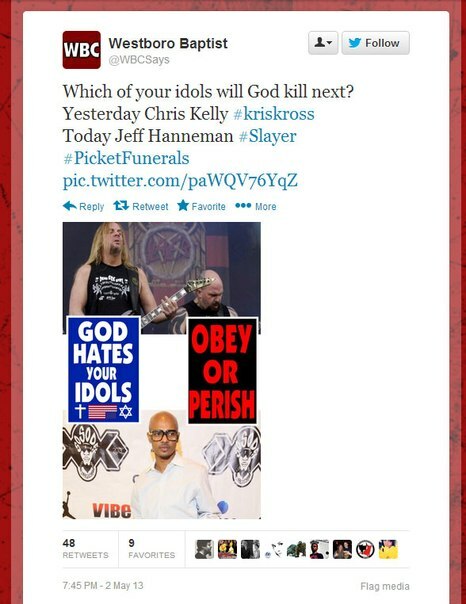 "Which of your idols will God kill next? Yesterday Chris Kelly from KRIS KROSS. Today Jeff Hanneman from SLAYER". In addition, the fanatics threatened to thwart the memorial service in honor of the musician which, fortunately, didn't happen. From Cradle of Filth's concert tour in Russia dropped out two gigs. At first, concert in Nizhny Novgorod, according to the organizers, was cancelled for "technical issues", this information was confirmed by the band on Facebook, writing that "due to the equipment and PA hire truck being involved in a severe crash on the motorway". A little later, almost at the outset of the show in Novosibirsk, it was cancelled. Many fans, and later representatives of the concert Agency "Sibirskie gastroli" insisted that the second Cradle of Filth's concert was thwarted by religious activists who pressured the authorities and the owners of the club, where the show would take place. But, despite the fact that the gig was cancelled, the organizers managed to find a way out and arranged a meeting with fans and Cradle of Filth, during which metalheads could chat, take pictures and get autographs from musicians. "The submission materials do not contain any characteristics of extremist materials, namely the excitation of social, racial, national, political, religious hatred; propaganda of exclusiveness, superiority or inferiority of a person on grounds of social, racial, national, religious, political or linguistic affiliation; demonstration of Nazi and neo-Nazi paraphernalia.These works are available for club public performance for audience focused on this subculture." We hope that devouts and other moralists will listen to the opinion of professionals and direct their energy to deal with real problems. After all, who else but them know that the forbidden fruit is sweet and thanks to their activities they generate among young people even more attention to the "undesirable" bands.